ISW assessed in early June 2015 that one of ISIS’s most likely courses of action during the Islamic holy month of Ramadan would be to declare a governorate in Russia’s North Caucasus. ISIS indeed announced the creation of a new governorate, called Wilayat Qawqaz (Caucasus) in the region on June 23, 2015, after several senior militants in the area pledged allegiance to ISIS. The announcement pits ISIS against the Islamic Emirate of the Caucasus, an official al-Qaeda affiliate that has operated in the mountainous region of southwestern Russia since 2007. ISIS has been setting conditions to establish this governorate in support of its regional expansion campaign since at least January 2015. ISIS’s statements and actions over the next few weeks will indicate whether the organization intends to launch operations through its new Caucasus affiliate, or whether it simply intends to use the pledge as an opportunity to assert its global vitality and reach. ISIS’s spokesman Abu Muhammad al-Adnani declared the creation of a new wilayat, or governorate, in the North Caucasus region of Russia on June 23, 2015. Al-Adnani named “Abu Mohammad al-Qadari” the leader of the group, and congratulated “the soldiers of the Islamic State” in the Caucasus. Adnani’s statement followed the circulation of a Russian-language audio statement on Twitter on June 21, in which supporters of ISIS in the regions of “Dagestan, Chechnya, Ingushetia, and KBK (Kabarda, Balkaria and Karachay)” pledged allegiance to ISIS’s leader Abu Bakr al-Baghdadi. These areas represent four of the six subdivisions that constitute the al-Qaeda-affiliated Islamic Emirate of the Caucasus (IEC) militant group. Militants in these four most frequently conducted domestic attacks in support of the IEC’s stated goals of establishing a Caucasus emirate under sharia law and waging global jihad. The two IEC subdivisions where supporters have not formally pledged to ISIS are Cherkessia and Nogay steppe, which have claimed few attacks since the IEC’s founding. ISIS’s announcement is especially damaging in light of the IEC’s current leadership vacuum. Russian security forces killed the IEC’s leader, Aliaskhab Kebekov, in April 2015 and it is unclear whether Kebekov’s rumored successor, Magomed Suleymanov, retains popular support within the Caucasus. ISIS’s declaration may catalyze the disintegration of the IEC, giving ISIS new opportunities to launch operations in the region. But ISIS began preparing for a declaration of Wilayat Qawqaz since January 2015, before Kebekov’s death. Adnani’s announcement follows months of growing support for ISIS among commanders throughout the IEC. Three Chechen and three Daghestani commanders recanted their allegiance to Kebekov and pledged allegiance to Baghdadi over the course of November and December 2014. The defectors included Rustam Aselderov, who was the leader of the IEC’s Daghestan subdivision. Analysts speculated that these commanders may have defected to ISIS because of Kebekov’s aversion to suicide bombings and civilian casualties as well as his prioritization of building social support above military operations. Kebekov promptly dismissed and replaced the errant Aselderov in December 2014, and warned other IEC militants against joining the group. ISIS celebrated these pledges from the Chechen and Daghestani commanders in the January 2015 issue of its official English-language magazine Dabiq and claimed that the process of creating a wilayat in the “region of Qawqaz” was “underway.” The reference suggested that ISIS’s leaders were by that time in contact with supportive elements in the Caucasus, which ISIS claims is a necessary step towards the creation of a wilayat. The process of establishing the new governorate accelerated rapidly in mid-June, as additional elements of the IEC rapidly pledged loyalty to ISIS. Emir Khamzat, the leader of the IEC’s subdivision of Nokhchicho (Chechnya), pledged allegiance to Baghdadi on behalf of all of his fighters in an audio statement released on June 13. ISIS’s supporters on Twitter then circulated the most recent audio pledge on June 21, allegedly on behalf of militants from the four operational areas of the IEC listed above. If true, the statement would indicate that the majority of the IEC’s active force is now loyal to ISIS. ISIS’s announcement of “Wilayat Qawqaz” opens a new front in the battle between ISIS and al-Qaeda for the leadership of the global jihadist movement. 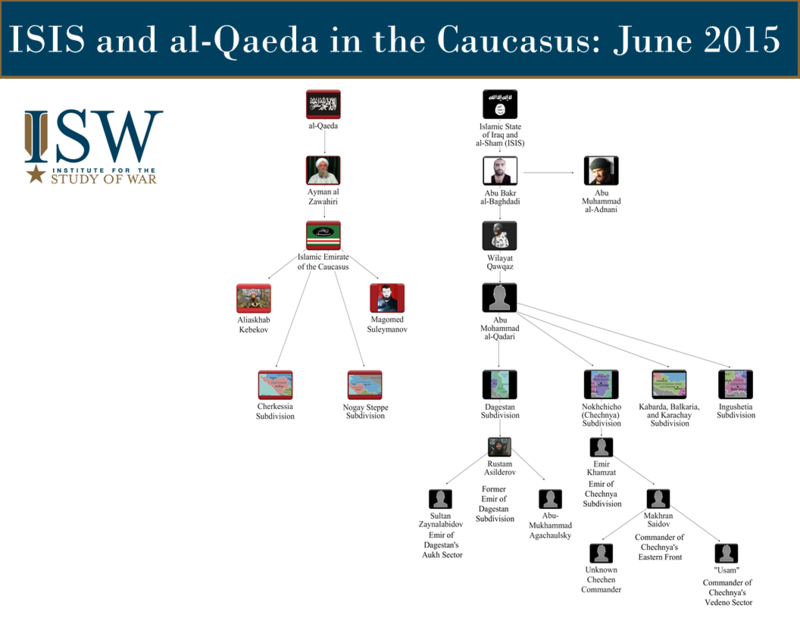 The IEC has maintained strong ties to al-Qaeda since its founding in 2007 and both Kebekov and Suleymanov reaffirmed their loyalty to al-Qaeda amidst the defections to ISIS in December 2014. Prominent al-Qaeda ideologues from multiple affiliates responded to the defections in pulblic statements. Prominent ideologues from multiple affiliates of al-Qaeda, including Harith al Nadhari and Ibrahim al Rubaish from al-Qaeda in the Arabian Peninsula (AQAP) and Abu Maria al Qahtani from Jabhat al-Nusra (JN), also released a joint statement on January 28, 2015, denouncing ISIS and the defectors from the IEC. The seniority of these signatories indicated that al-Qaeda’s leadership was particularly concerned about ISIS’s growth in the region, suggesting that significant numbers of IEC fighters likely had defected with their commanders. This assessment was strengthened in March 2015 when AQAP released a video calling on Muslims to provide financial aid and other assistance to the Caucasus in a likely bid to strengthen the IEC against ISIS’s expansion. It is unclear whether al-Qaeda will reinforce this commitment to the IEC over the coming weeks in light of the recent pledges to ISIS or whether the organization will prioritize its efforts on other fronts such as Syria, Yemen, and the Sahel. ISIS’s claim of a new wilayat likely will encourage Russia to increase its counterterrorism operations in the North Caucasus. The Russian government accelerated its domestic security efforts in the region following a gun battle that Islamic militants initiated against government forces in the Chechen capital of Grozny in December 2014. Russia’s Foreign Minister Sergei Lavrov subsequently claimed on April 22 that ISIS is Russia’s “greatest enemy,” ranked above China or NATO. The Russian government will likely use the announcement of Wilayat Qawqaz as a justification to vigorously stamp out separatist sentiment in southern Russia. This may counterproductively fuel popular discontent and militant recruitment within the region. Russia also may use the development as a pretext to increase its involvement in Syria and Iraq, where it has recently equipped the Iraqi Security Forces with new supplies of Russian anti-tank rockets. This foreign intensification by Russia may complicate relations between the United States and its European partners as they attempt to balance Russian participation in the anti-ISIS effort with resistance to Russian actions in Ukraine. It also may overstretch the Russian government, which is balancing engagement in Ukraine and the Middle East with domestic counterterrorism operations and an economic crisis. 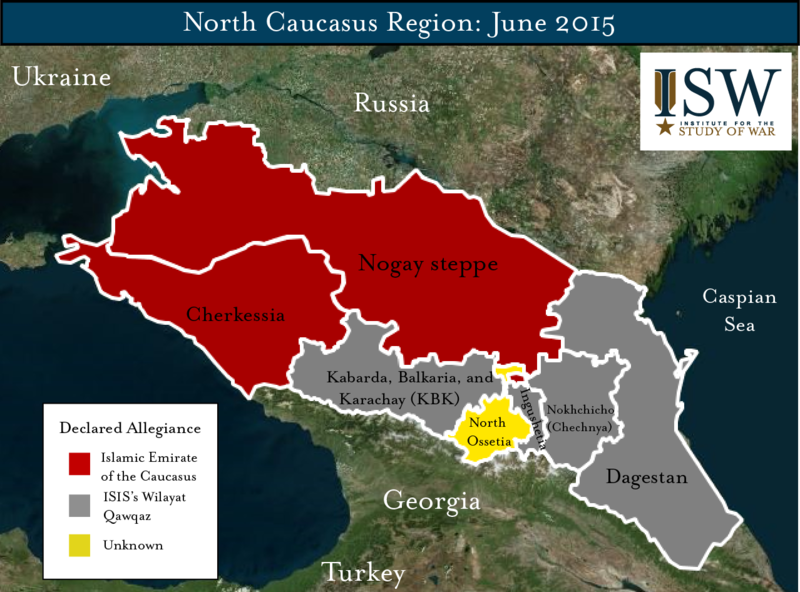 ISW assessed in early June 2015 that one of ISIS’s most likely courses of action during the Islamic holy month of Ramadan would be to declare a wilayat in the Caucasus. It remains to be seen whether ISIS will devote significant military or financial resources to the area. ISIS’s creation of Wilayat Qawqaz may be a publicity effort meant to boost morale rather than a statement of intent to initiate military operations. However, ISIS has repeatedly voiced its interest in the Caucasus over the past year. The organization maintains a large base of Chechen fighters within Iraq and Syria, and frequently releases Russian-language propaganda encouraging individuals to pledge allegiance to ISIS. For example, ISIS’s al-Hayat Media Center recently released a Russian-language magazine on May 28 in which Chechen militants in ISIS allegedly proclaimed their desire to share their military expertise with fighters in the Caucasus. ISIS may thus attempt to reinvigorate the Chechen insurgency in support of its Near Abroad campaign to accelerate regional conflicts. Alternately, it may seek to provoke the Russian state by launching attacks in prominent cities such as Moscow or St. Petersburg. Statements from ISIS over the coming weeks recommending specific targets or operations will likely clarify how ISIS intends to fold Wilayat Qawqaz into its global expansion strategy. Regardless of the ultimate decision, both the pledge of allegiance and the declaration of Wilayat Qawqaz will enable ISIS to assert its continued expansion and vitality at the expense of al-Qaeda, the Russian state, and the international anti-ISIS coalition.